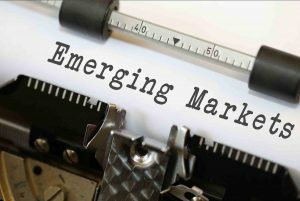 Home › Market News › Research & Analysis › Equity Research; Emerging market (EM) “contagion”? Equity Research; Emerging market (EM) “contagion”? June 13th 2018 – the last rate hike from the Federal Reserve – was the seventh rate hike since 2016 when the US rate cycle turned. The Federal Reserve is seen as “behind the curve” i.e. interest rates have to rise due to the risk that accelerating GDP growth and strong consumer demand (helped by Trump tax cuts) are creating inflationary pressures. The current Fed Funds target rate of 1.75%-2% is seen rising to 2.25%-2.5% by the end of 2018. This is necessary to counter rising inflation at 2%, and a strong consumer economy buoyed by falling unemployment, tax cuts, strong US equity market etc. During 2016 and 2017, world markets took US rate hikes in their stride. After all 2008 crisis level rates were no longer appropriate. However 2018 has seen higher US interest rates help create stress in fragile emerging markets. It is worth recalling 1979-81 when the Federal Reserve under Paul Volcker hiked Federal funds to 20% to stem US inflation – it brought about a crisis in Latin America – a region where 50% of GDP was externally borrowed. A “lost decade” ensued that saw first Mexico, then Brazil and Argentina default. 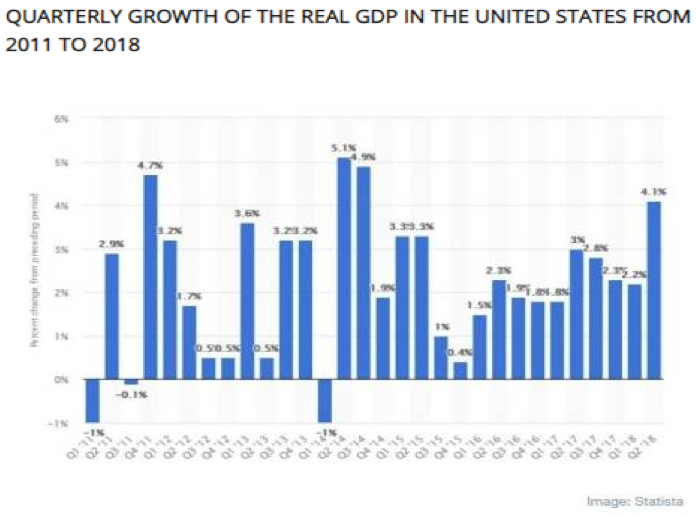 As US rate hikes lead to higher returns on US risk free assets, they encourage fund repatriation from emerging markets that are more vulnerable in 2018 due to i) the prospect of trade wars/ tariffs/ sanctions inhibiting growth ii) actual currency destabilization and iii) specific local factors. But it is incorrect to attribute emerging markets stress entirely to the US rate cycle. Whilst US rates supports the view on the timing and context for emerging markets, there are other major factors. Since the 2008 crisis, emerging markets have been a beneficiary of very low US interest rates, which enabling easy borrowing of vast amounts at low interest rates. Total EM borrowing rose from US$21trn in 2007 to $63trn by the end of 2017 – over 200% of GDP. As usual with all credit booms, the credit oversupply has led to poor lending decisions, lending to perennially weak counterparties, lending on terms that made it easier for borrowers to default. There is evidence that lending to EM governments has been slack and chickens are coming home to roost. A) Turkey – the June 2018 re-election landslide win for the authoritative Erdogan government, (which has detained c. 160k people since the failed coup) ushered in a period of instability whose early cause (10th July 2018) was the appointment of his son in law, Berat Albayrak as Treasury Secretary and Minister of Finance. 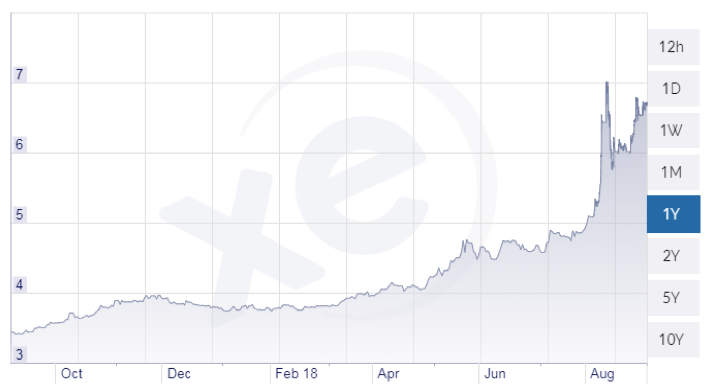 Albayrak resisted hiking interest rates (24th July) which accelerated the lira’s rapid decline, a move interpreted as Erdogan getting in the way of the central bank’s currency management. 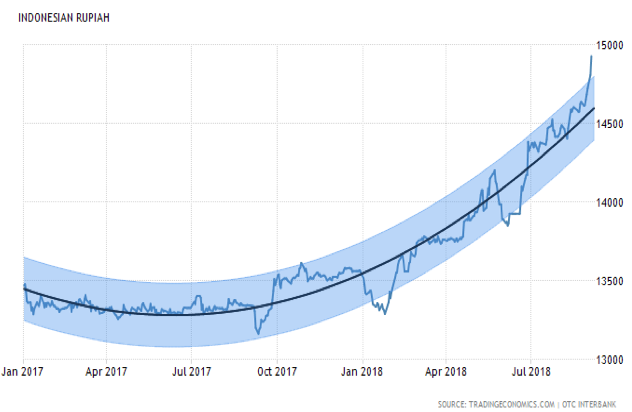 The fall in the lira is likely to result in 20% inflation (from 13.4% now) which means recession in 2019 and/or visit to the IMF. However Erdogan is flatly opposed to the IMF option as this would play into Washington’s hands. The spat with US President Donald Trump also highlights the “personal” nature of the Turkey problem – which looks likely to rumble on unless Erdogan backs down, both on rate hikes, and on US relations. Turkey’s EU ambitions are forlorn, it no longer expects EU entry. Turkey will have to contend with its position on the outskirts of the world’s largest trading bloc. Turkey’s “original sin”, in voting for a demagogue in June is likely to have lasting repercussions – no easy answers or ways out. The Lira problem has helped trigger sell offs in other fragile emerging markets currencies and capital markets. B) Argentina has faced a currency crisis in every decade going back 60 years. Last month the peso fell 25% due to significant capital outflows. Current inflation of 30% is more than double the 15% government target, but half the level of interest rates at 60%. Argentina, whose “corralitos” (pig pens) in 2001 basically froze then stole foreign currency bank deposits held at Argentina’s commercial banks – is seeking US$50bn from the IMF having introduced fresh austerity measures such as raising export taxes and cutting government spending to achieve a primary budget surplus of 1% in 2020. But in a country that has long promised but rarely delivered, any whiff of financial instability can see creditors run for cover. Argentina has $28.3bn in financing needs over 2019 which it hopes to meet by rolling over $12bn of bonds, into new bonds and IMF loans of $11.7bn with financial institutions possible buyers for the remaining $4.6bn of bonds (which will require a roadshow and positive investor reception). Argentina has been through major crises before, worse than the present, it will stagger through this one too. The only issue is the investor “haircut” this time around. C) Indonesia; is a classic emerging markets problem; the country reported a record $2bn current account deficit in July, the highest in five years. The country has the highest proportion of debt (35% GDP) in Asia held externally i.e. owed to foreign lenders in USD or other hard currencies. The Indonesian rupiah fell to 14,777/ USD its weakest level since 1998 and down 8.93% since 2017. Attempts by Bank Indonesia to intervene in currency and bond markets have yet to make much impact. Whilst there are problem countries and EM catalysts, it is not yet obvious that the EM problem has turned systemic, it is still idiosyncratic to a few countries. Current problems are not at the pitch of an Asian or LatAm crisis. Since the “BRIC” acronym was coined due to the convergent performances of Brazil, Russia, India and China, during the last ten years BRIC fortunes have diverged sharply. It is no longer accurate to contend that BRICs are similar. The same holds elsewhere in the diverse EM space, EMs are doing their own thing. Sub-Saharan Africa is “emerging” as an investment destination for China/ EU countries. There are grounds for buying the near 20% dip in Shanghai equities. The recent run up in Mumbai shares to five year highs has come despite a low rupee, high oil prices and India’s ongoing weak export performance. The recent election in Malaysia, removing a totally corrupt incumbent supports the view that democracy has matured and can deliver. Turkey take note. EM valuations occur in often shallow markets with limited liquidity. They reflect investment issues quickly, sell offs are brutal but can be short lived. To conclude emerging markets are a “horses for courses” area where local investment expertise is important, quite possibly the problems ascribed to emerging markets have been overpitched, owing to very strong US economic and capital market performance, relative to EM. The win/ lose from current EM corrections? Even if we assume emerging market problems are the primary cause of current index weakness, the impact seems overdone. UK100; impact has been c.-450 points (-5.7%) from highs possibly abetted by low summer trading volumes. Antofagasta- expenses are in depreciating Chilean pesos; (CLP) which has moved from CLP640 to CLP690/ USD in one month. However poor interim results (EPS 19.6 cents down 33%) were a larger problem. HSBC – board are regretting their 2016 decision to keep the Turkish business. The revenue mix (5% Latin America, 5% Middle East/ North Africa, 49% Asia) gives ample grounds for concern over revenue growth in some key areas. Vodafone- significant EM exposure via loss-making Indian subsidiary, however bigger concern is new CEO and dividend sustainability in the context of higher debt. Standard Chartered (80% revenues from Asia, Africa or Middle East)- STAN is off 110p (-15%) over summer, the biggest casualty. Unilever – 16% of revenues are emerging markets, similar to peers Colgate Palmolive and P&G, however this factor has not hurt the shares, which have recovered losses from the decision to drop ULVR from the blue chip index. Fresnillo, Randgold Resources, Polymetal – all have 100% assets located in EM based, stock losses 15.3% from highs for Fresnillo, 40% Randgold and -7.3% for Polymetal.